After an exceptional six years as the Executive Director of the Providence Children’s Film Festival, Anisa Raoof will be stepping down in Spring 2019. The Board of Directors applauds Anisa for providing dynamic leadership and deepening PCFF’s engagement with the wider Providence community while maintaining a passionate dedication to the power of film as a shared experience to inspire and delight young lives. Anisa joined PCFF as a board member in 2012, bringing her entrepreneurial and social media expertise as founder of Kidoinfo. 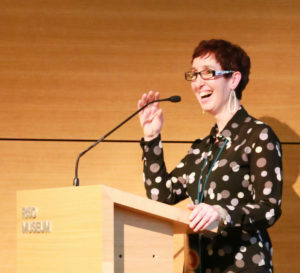 As Executive Director of PCFF, Anisa was committed to broadening access to the festival and established the Film Hub, the Youth Filmmakers Showcase, free screenings at Rhode Island Public Libraries and Public Parks, and film literacy programs for schools, libraries and community groups across the state. “Film has the power to transform the way we think about the world and our place in it. I am so proud of the work we have done as a team to spotlight and connect compelling visual stories by international filmmakers with young audiences here in Rhode Island. And thankful to our amazing community partners that have been instrumental in informing and amplifying our programming. Together we leveraged our resources to not only enable films to reach more people but to inspire learning and creativity,” Anisa said. As PCFF celebrates its tenth anniversary, A Decade of Wonder, we are especially grateful for Anisa’s stewardship and vision in reaching this milestone. We look forward to counting her among our fans and champions as we continue to bring our community together to celebrate the world of stories through film. The PCFF Board of Directors will soon launch a regional search for Raoof’s replacement. A job posting will be made available on the PCFF website in the near future.